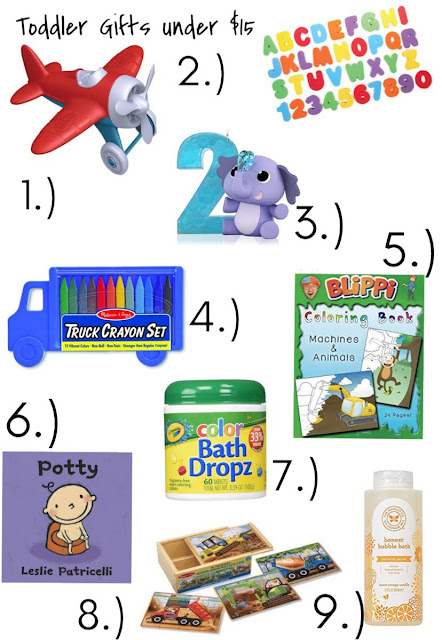 Thrifty Wife, Happy Life: Toddler Gifts Under $15! Whether you are a parent of a toddler or you have nieces and nephews to buy for, kids are the best to Christmas shop for. It always makes me happy to buy little kids Christmas gifts. The best thing about kids is that it doesn't take much to excite them. My little guy gets excited over a sticker. Today I'm sharing 9 toddler gifts under $15! These make great stocking suffers or just small gifts for any toddler on your shopping list. I'm a huge fan of Green Toys! Jack has a couple of these toys and he really loves them! They are made well and perfect for little kids, plus they are made from recycled materials so they are environmentally friendly, which is always a plus! This is one of Jack's favorite toys! He loves the alphabet and these letters helped him learn it. I credit YouTube Kids for most of his alphabet knowledge, but playing with these letters let him practice them and get even better at the alphabet. My mom gave me an ornament in my stocking every year, and I still have them all. I would love to start that tradition with Jack. Ornaments are great, because you can give them something that they are interested in or will help you remember that year. The Easter bunny brought Jack this crayon set last year and let me tell you, it's our favorite set of crayons. They are triangle, so they don't roll off the table like other crayons. They also are harder to break and they clean off of furniture and floors much easier than other crayons. I'm not sure if you have little one's obsessed with Blippi, but we love him at our house. Jack learns so much from Blippi. This coloring book goes a long with a lot of the Blippi videos. It's really cute and perfect for toddlers. Books are always a good gift idea for every age. I especially like books that talk about relatable topics for kids. Books about becoming a big brother or sister, books about manners and in our case a book about potty training. These color drops are a great stocking stuffer. They make bath time really fun. You can mix the colors and experiment with them. They sometimes are the only way I can get Jack into the tub at the end of the day. I love Melissa and Doug toys. They make the best toddler puzzles. I love the little 4 in 1 puzzle sets, because they are compact and easy to clean up and store. Lastly, I have to share my favorite bubble bath. Kids love a bubble baths. This always makes a nice stocking stuffer. I love the smell of this bubble bath and it's very gentle on skin, which is what you need during the dry winter months. Hopefully you find this gift guide helpful for your little ones.